This new companion to Hochberg et al. 's Rheumatology masterwork presents current insights into the causes, detection, and therapy of this condition. It provides "one-stop" coverage of scientific and clinical developments, including new concepts in epidemiology and genetics and pathogenic mechanisms · new developments in diagnostic interventions and prevention · and the very latest concepts in treatment. 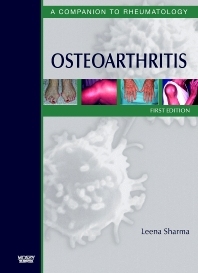 Features the work of leading experts in osteoarthritis. Presents current diagnostic criteria and knowledge of pathogenic mechanisms. Discusses the very latest advances in treatment, including pharmacologic interventions. Provides new concepts in epidemiology and genetics of osteoarthritis, including modifiable and non-modifiable risk factors.